When you think a defect item qualifies for warranty please let us know by using the return form. In accordance with the European guidelines we use a 2 year warranty on our products. However, the warranty only includes the resupply of faulty goods, on condition that it is established that this involves a manufacturing fault. For faults resulting from improper handling, as well as for those cases for which the cause of the fault is not the result of a manufacturing fault, the guarantee lapses. For more information on this subject we refer you to our general conditions. If you send the correct item back to us, your deposit will be refunded. 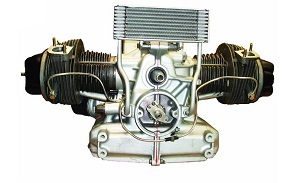 One of the conditions is that the returned goods are found suitable for overhaul by either DG Spare Parts Service or the manufacturer. Transport of the goods to be supplied by us is carried out for account of the purchaser. The costs for transport on the order confirmation/internet invoice are indicative. This is a base rate. If supplements apply because of different measurements or weight we will contact you before sending the package.Every Monday till Friday De Graaf SPS has a bus driving around the Netherlands and Belgium. We deliver orders from customers. This service from De Graaf is only for businesses and it's based on route, order day and the amount of the order. We use PostNL and UPS for transport of the packages. If you leave your email address we will be able to send you an email with your Track and Trace number. With this information you van follow your order and you will know on which date it will be delivered. Please note that the responsibility of the goods is no longer in our hands once we handed over the goods to the transporter. The goods to be supplied may be insured on request of the client, where the costs are for account of the client. It is always possible that you have to send one of the products back to us. It could be that we send the wrong article by accident or warranty. 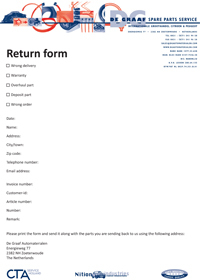 Download the return form here. Send the completed form along with the product you are returning. One of our staff members will contact you as soon as possible to process the returned goods. Please note that the parts you send should be properly and in the original packaging.